1. Soft,light and breathable: With 45%Ramie and 55%Cotton, this sweater is in soft texture and feels smooth,which gives you good hand feel. It's also light and breathable. 2. 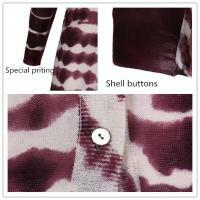 Unique design: The printing pattern and color is quite special,which can show wearers' uniqueness and character. 3. 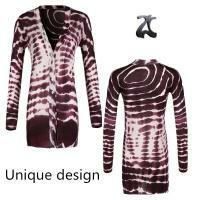 Sophisticated workmenship: The pattern of this sweater is complicated, which is uneasy to dye. And we attach much attention to each detail when making this sweater.The seams are careffuly stitched and the size is strictly controlled. * Direct supplier: As a direct sweater manufacture in Dongguan China, We have both factory and marketing department to offer you more competitive price and good quality. * Specialized and concentrated: We have been in sweater line for 8 years and concentrated in producing all kinds of sweaters. All our sweaters are hot selling all over the world. 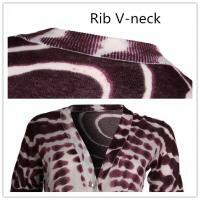 * A variety of sweaters: we can use all kinds of material to produce sweaters in different styles. And all sweaters can have different decoration like embroidery, sequin, acid wash, woven fabric and so on. * Best service: our marketing department will reply your inquiry and questions on time and offer their professional suggestion for you to make great sweaters. * Complete production equipment and departments:From sweater knitting to packing, our sweater factory have 9 departments to work and control the quality.